About 1.5 million Latinos are eligible to vote in Florida, representing approximately 14 percent of the more than 11 million eligible voters in the state, according to a Pew Hispanic Center analysis of data from Current Population Surveys conducted by the U.S. Bureau of the Census in 2003. Of those Florida Latinos, who are U.S. citizens and at least 18 years old, some 540,000 or 36 percent identify themselves as being of Cuban origins, and another 480,000 or 32 percent identify as being of Puerto Rican origins. Another 315,000 or 21 percent trace their origins to Central and South America. About 60 percent of Florida’s Hispanic voters live in just three counties each with different characteristics. Miami-Dade County is home to 590,000 Hispanic eligible voters or 39 percent of the state’s Latino electorate, by far the largest concentration in the state. Two-thirds of them are of Cuban origins. Latinos account for 52 percent of the eligible voters in the county. Orange County, where Orlando is located, is next largest with a Hispanic voting population of 166,000 or 11 percent of the state’s Latino electorate. Two-thirds are of Puerto Rican origins. Latinos account for 14 percent of the county’s voters. Broward County, where Fort Lauderdale is located, has 165,000 Hispanic eligible voters or 11 percent of the state’s Latino electorate. Central and South Americans are the largest Hispanic group in Broward, representing 42 percent of the county’s Latino voters. Puerto Ricans are the next largest group with 30 percent and Cubans make up 20 percent of the Hispanic voters in Broward. Latinos represent 14 percent of the county’s voters. Nearly three-quarters (73%) of Florida’s Cuban voters live in Miami-Dade. The rest of the Cuban electorate is scattered across the state. Puerto Rican voters are much more evenly distributed around the state. The largest concentration in any one county is the 23 percent of Puerto Rican voters in Orange County. Elsewhere, Miami-Dade (11%), Broward (10%) and Osceola (9%) also have significant shares of Florida’s Puerto Rican voters. The largest concentration of Central and South American voters is in Miami- Dade(38%). Other significant shares are located in Broward (22%) and Orange (11%). 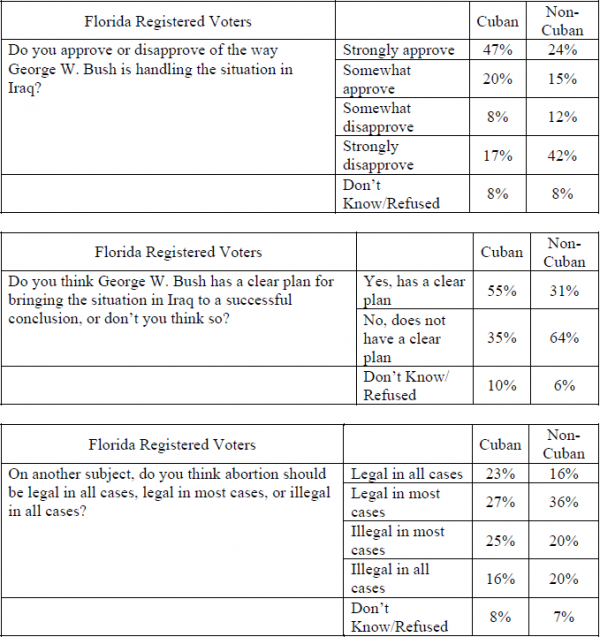 In a survey taken earlier this year, Cuban voters in Florida were significantly more supportive of President George W. Bush’s handling of the war in Iraq than non- Cuban voters. However, there were only small differences between the two groups on social issues like abortion, according to The Pew Hispanic Center/ Kaiser Family Foundation 2004 National Survey of Latinos: Politics and Civic Engagement. Data on Florida’s Hispanic electorate was extracted from the monthly Current Population Surveys (CPS) conducted in 2003 by the U.S. Bureau of the Census. The CPS is the U.S. government’s preeminent monthly survey and serves as the basis for the U.S. Bureau of Labor Statistics’ monthly employment release, as well as the nation’s official poverty estimates. Combining data from 12 monthly surveys created a sufficiently large sample to allowed a detailed analysis of the Hispanic population in Florida. The 2004 National Survey of Latinos: Politics and Civic Engagement was conducted by telephone between April 21 and June 9, 2004 among a nationally representative sample of 2,288 Latino adults, who were selected at random and were interviewed in either English or Spanish, based on the respondent’s preference. The sample included 328 persons in Florida who said they are U.S. citizens and are registered to vote. About two-thirds of the non-Cubans in this sub-sample are of Puerto Rican origins.